Tara Moss is a bit of a magpie when it comes to old things. Old, rusty, dusty and broken things had a way of coming home with her. But while her house filled up with antique wares, it was only about five years ago that Tara started wearing vintage and reproduction fashion. While watching Marilyn Monroe movies Tara had a realisation that her body was a similar shape to Miss Monroe’s, that clothes in this modern age were not made for such a body type and that the best way to embrace her curves was to dress like Marilyn! But it’s not just 1940’s and 1950’s fashion that Tara Moss is recreating today. It’s the mentality of the era. Especially when it comes to being a little less wasteful and a little more crafty. Tara started learning to sew in 2016 and is now taking you along for the ride (and to help out a fellow sewing novice) with her youtube channel! Tara Moss documents all her vintage passions, finds and adventures in her vintage caravans at Victory Lamour where she says having the vintage alter ego helps her celebrate women today, but also women’s work and craft from history (or HERstory). 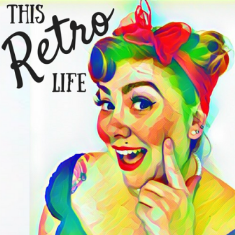 If you want to hear more about the many fabulous elements to Tara Moss’ love of vintage, and hear a sneak peak about her upcoming novel – check out our latest episode.